How would you invest money you didn't need for ten years? Is China About to Shock the Market? Is This the Next Mobile Phone Movement? BREAKING : Massive Shooting In Florida 2 Dead 16 Wounded -- America Falling Apart!!!! The Greenback Fires a Warning Shot: Are Commodities in Trouble? Famed statistician, Nate Silver, has for the first time predicted that Donald Trump will become the next President of the United States. Silver, in his "Now-cast" election model says that if ballots were cast today, Trump has a 57.5% chance of winning. Clinton has only a 42.5% chance. July is such a precious, peaceful month. I think we ought to ban political activity and news coverage the whole month, just so we could get some peace & refreshment. If y'all could drive through Robinson Branch with me where it's cool and the green sunlight trickles through the leaves, you'd vote for peace & refreshment, too. I woke up this morning thinking about gold & silver, something I don't usually do. It occurred to me that we will probably see metals moving sideways through at least half of August. If y'all had been through as many Augusts with gold & silver as I have, you'd be expecting them to begin rallying in the latter half of August. Markets are hesitating like a baseball flung in the air, just before it turns and starts down. US dollar index sustained its habits of slovenly weakness and lost 20 basis points (0.21%) to 97.32. Broke out of the triangle, but won't follow through. Still makes no sense. You'd have to be one speculatin' FOOL to sell dollars for euros now. I'm sorry, call me a tick-bitten, chigger-riddled, one-gallus hick, I just can't make a lick of sense out of the scrofulous dollar. Yen has gotten snagged in its 50 DMA, & so far that's stopped its roll down the hill. Gained 0.3% today to 94.52. D'yall ever push an upright piano out a window? Once you get it on the window sill, you can just inch it out a little bit at a time & its weight is still mostly on your side or balanced. Right the second it gets overbalanced, that whole thing turns casters up in the air and falls 4 stories to the sidewalk. That's what this chart reminds me of: http://schrts.co/vtdPMb Yep, it's the S&P500. Today it lost another 6.55 (0.3%) trading sideways & closed 2,168.43. Dow looks the same. Lost 77.79 (0.42%) to 18,493.06. They're pushing further & further out that window, & one day they'll get overbalanced. OIL (WTIC) is trying to break down. http://schrts.co/vtdPMb Closed today below the lower channel line. On rising volume. Gold lost $3.60 (0.3%) to $1,319.50 on Comex. Silver subtracted 4.2¢ (0.2%) to 1961.5¢. You have to be patient enough to let any pattern work itself out, but gold has now traded into the nosecone formed by the bullish flag boundaries and the uptrend line from June. Bumped into the uptrend line today, but didn't close there. Unless it closes higher tomorrow, it runs the risk of breaking that uptrend line and falling back to the 50 DMA at $1,291. Silver's here, http://schrts.co/n7iIb4 Silver has traded out into the nose of a triangle and has about one more day before it will be squeezed out. Closed today right on the 20 DMA. I'm gonna get in trouble if I keep trying to say something when I've said all I had to say, so I'll say Good Night! Technical analyst Jack Chan charts a breakout of the U.S. dollar and comments on its implications for gold and silver. One in six investors chose gold as the best place to park money they wouldn't need for more than ten years – the same number that chose stocks, according to a recent Bankrate survey. Another 6% chose bonds, while 25% chose real estate, and 23% said they would simply bank the money. To the typical Wall Streeter, these results represent a world turned upside down. 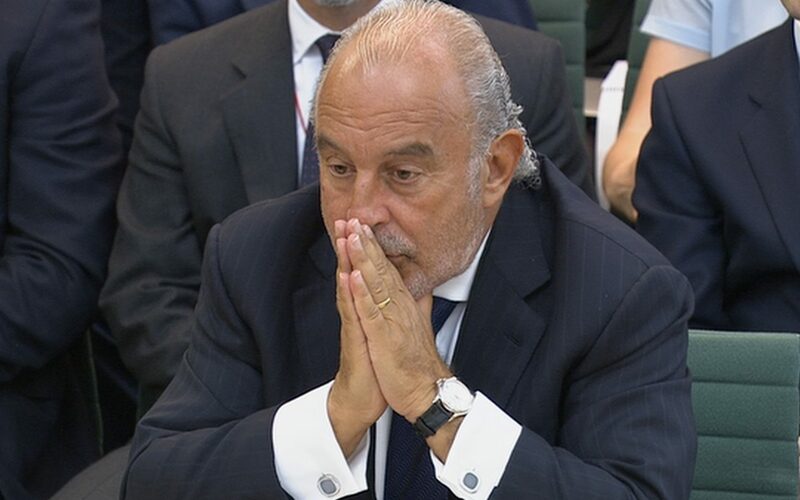 CNBC's Jim Cramer took one look and lamented, "As someone who has lived and breathed stocks for most of my life, this is a horrendous finding. But it's not surprising." After the turmoil of last week's RNC, this week' Democratic Nation Convention is off to an even more chaotic start (no matter what the surrogates desperately try to say). Wasserman Schultz resignation and decision not to 'gavel in' the convention is over-shadowed by the increasingly loud voices of Bernie (who will speak tonight) supporters booing any mention of Clinton-Kaine, but according to the mainstream media, Michelle Obama's headline speech tonight will bring the party together. Or do voters know something else? Did Jane Sanders just drop a huge hint at what comes next? While almost inaudible, some have suggested she says: "They don't know your name is being put in nomination..."
The list of speakers released by the Democratic National Committee is incomplete. Clinton's running mate, Virginia Sen. Tim Kaine, has yet to be added to the schedule, as well as many of the federal and state elected officials,who were announced as speakers on Thursday. House Democratic Leader Nancy Pelosi of California and the Democratic women of the House, including Rep. Bonnie Watson Coleman of New Jersey's 12th District. Mothers of the Movement, mothers who lost their children to gun violence or to enounters with law enforcement. Henrietta Ivey, a Michigan home care worker who advocates for a $15 an hour minimum wage. Goldbroker.com is a precious metals investment company that enables investors to own and store gold directly in their own name (no mutualized ownership) in Zurich and Singapore. Goldbroker's clients are not exposed to any counterparty risks. They own gold and silver in their own names (the ownership certificate cites the name of the investor and serial number of his bars) and they have storage accounts opened in their own name as well. So Goldbroker.com's storage partner knows the exact identity of each investor. Goldbroker.com doesn't store in the name of its clients; rather, Goldbroker's clients store personally. All investors have direct access to their gold and silver bars. Goldbroker.com was launched in 2011 so that investors would avoid any counterparty risk when investing in physical gold and silver. This post Is China About to Shock the Market? appeared first on Daily Reckoning. Did the U.S. just double-cross China under the Shanghai Accord? If so, China will act on its own to devalue the Chinese yuan. In that case, the Dow Jones Industrial Average could plunge to 16,450, and the S&P 500 could plunge to 1,925 in a matter of weeks, wiping out trillions of dollars of investor wealth. This is not guesswork. Plunges of over 10% in U.S. stock indices happened twice in the past year. Both times it was because of a combination of a stronger dollar and weaker yuan. It's happening again. And you need to understand the dynamics both to avoid losses and reap big gains by positioning ahead of the meltdown. China is struggling under the weight of too much debt, poor demographics, and competition from lower priced suppliers in Vietnam, Indonesia, and the Philippines. China needs economic relief. Fiscal stimulus just means more non-sustainable debt. China has too much of that already. The easiest way to give the Chinese economy a boost is to cheapen its currency, the yuan (CNY), to make its exports more competitive. When China cheapens CNY, they encourage capital flight. The wealthy and well connected try to get their money out of China as quickly as possible before the next devaluation. This causes the dumping of Chinese stocks, which soon infects U.S. stock markets and causes a global liquidity crisis. 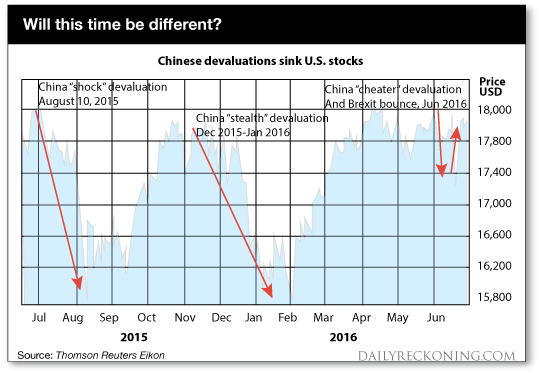 The last two times China devalued, U.S. stocks fell over 10%. The Shanghai Accord, agreed in Shanghai, China on February 26, 2016 was an effort to give China some relief without having to devalue CNY against the U.S. dollar (USD). The solution was to keep CNY pegged to USD, but weaken USD against the euro and the yen. China has a larger trading relationship with Europe and Japan than it does with the U.S. The Shanghai Accord gave China the currency relief it needed against major trading partners in Europe and Japan without breaking the peg to the dollar and upsetting global capital markets. It was a neat solution. The only losers were the yen and euro, which had to get stronger under this plan. From early March to mid-May 2016, the Shanghai Accord worked like a charm. The yuan was stable against the dollar, and the dollar got weaker against the yen and euro. U.S. stocks staged a major rally from around 16,000 to almost 18,000 on the Dow Jones Industrial Index. It seemed that all was right with the world. Unfortunately, the Fed could not leave well enough alone. Instead of celebrating this truce in the currency wars, the Fed reneged on its weak dollar promise in May, and began talking about interest rate hikes possibly in June or July. The hawkish tone was expressed by several regional reserve bank presidents, notably James Bullard, Loretta Mester, and Esther George. The dollar rallied almost 4% in a few weeks. That's a huge move in currencies where changes are usually registered as small fractions of 1%. At that point, China felt double-crossed by the U.S. and began its third devaluation against the U.S. dollar. The first devaluation was the "shock" devaluation of August 10, 2015 where the yuan was devalued 3% overnight. The second devaluation was the "stealth" devaluation from December 2015 to January 2016. It was a stealth devaluation because China moved in small increments every day instead of one huge devaluation in a single day. The third devaluation is called the "cheater" devaluation because it reflected China's view that the U.S. was cheating on the Shanghai Accord. The cheater devaluation started in mid-May and continues today. The shock devaluation and the stealth devaluation both took place while the dollar was getting stronger in anticipation of U.S. rate hikes. Under the Shanghai Accord, the dollar got weaker, as agreed, and the yuan was relatively stable against the dollar. Finally, the Fed reneged and starting talking about rate hikes. The result was the dollar strengthened and the cheater devaluation began. What do all of the currency wars moves have to do with U.S. stocks? The answer is the USD/CNY cross-rate may be a more powerful determinant of stock prices than traditional barometers such as earnings, stock multiples or economic growth. This relationship is starkly illustrated in the chart below. As of mid-July, the Dow Jones Industrial Index (DJIA) hit all-time high of 18,533.05 and the S&P 500 also reached an all-time high of 2,166.89. But, those indices were close to those levels on two previous occasions, August 10, 2015 and December 16, 2015. 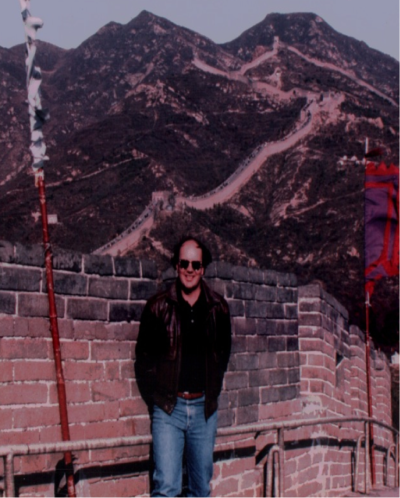 Both times China began to devalue and both times U.S. stock markets sank like a stone. The DJIA dropped 11% (Aug. 10 to Aug. 25, 2015), and 12% (Dec. 16, 2015 to Feb. 11, 2016). If history repeats, DJIA could drop to 16,450 or lower, and the S&P could drop to 1,925 or lower. As the chart shows, that process of a new crash had already started in early June, but the crash was "saved by Brexit." The Brexit vote caused an immediate collapse in sterling and the euro and led to a "risk off" flight to quality in dollars, gold and U.S. stocks. Now that the Brexit bounce is over and stocks are at nosebleed levels, the question is will history repeat itself, or will this time be different? At Currency Wars Alert, we use our proprietary IMPACT method to spot the next moves in major currency pairs. IMPACT is a method I learned in my work for the U.S. intelligence community including the CIA, and the Director of National Intelligence. It's based on what the intelligence community calls "indications and warnings." Even in the absence of perfect information, you can tell where you're going by unique signposts along the way. What are the indications and warnings we see on CNY/USD? Currency pairs don't move in a vacuum. They move in response to interest rate policy including forward guidance about policy. To a great extent, interest rates and exchange rates are reciprocals. If interest rates are higher, or expected to go higher, the currency will strengthen as capital flows in to take advantage of higher yields. If interest rates are lower, or expected to go lower, the currency will weaken as capital flows out in search of higher yields elsewhere. The knowledge that currency rates reflect trade deficits and surpluses is mostly obsolete. Capital flows dominate trade flows in the determination of exchange rates. When China devalued the yuan in August 2015, capital outflows surged. Once the yuan stabilized against the dollar in early 2016, the capital outflows were greatly reduced. Capital outflows from China will be one of the main indications and warnings we'll be watching in the months ahead to judge the impact of this latest Chinese devaluation. In the short-run, U.S. stocks are headed for a fall based on renewed tough talk by some Fed officials. The Fed is concerned that U.S. stocks are in bubble territory. They suggest that the easier financial conditions caused by higher stock prices make this a good time to raise interest rates. The rate hike talk then makes the dollar stronger and prompts China to weaken the yuan. The weak yuan triggers capital flight, which causes a spillover liquidity crunch, which in turn leads to a correction in U.S. stocks. Once the correction takes place, the Fed can rescue the stock market again with more dovish signals. This will weaken the dollar, stabilize the yuan, and reinstate the Shanghai Accord. Until then, the risks are that the Fed has not learned from its past mistakes and will ignore its responsibilities under the Shanghai Accord. August 2016 could be a replay of August 2015. The post Is China About to Shock the Market? appeared first on Daily Reckoning. -- writes in the firm's Equity & Cross Asset Strategy letter today that there's a standoff in the gold futures market between the bullion banks and speculators; that the banks appear to have increased their naked shorting of gold to contain the price, anticipating that they will smash the price, panic the speculators into selling, and cover their shorts, as they often have done; but that there were three episodes during gold's bull market from 2001 through 2011 when this tactic of the banks failed and gold "went parabolic." Mylchreest adds that speculators in recent months have been "far more resolute." This post Is This the Next Mobile Phone Movement? appeared first on Daily Reckoning. Trends are born. They grow and mature. Eventually, they reach old age and die. My research leads me to conclude we're on the cusp of a "clean phone" trend. This is when you want to catch a trend for the chance at the largest wealth — right at the start. As you'll see, this emerging trend is similar to the "clean food" trend that helped Whole Foods grow into a $10.6 billion company. The foundations of these two trends are also similar. Consumers knew chemically treated food was bad. They demanded clean food. Today, emerging research suggests cellphone use could be detrimental to your health. As the research compounds, consumers will demand clean phones too. Today, what I call "clean phone" tech is still in technology's womb. Those who act on the firms giving birth to this multibillion-dollar market segment could make enormous market gains. In trend forecasting, all things are connected. I call it Globalnomic. One trend impacts and feeds another, all the way around the world. To understand the market dynamics and growth potential of "clean phones" is to recognize the connection to "clean foods," a term I coined way back in 1993. How the Rise of Clean Phone Tech Will Mirror "Clean Food"
For most millennials, it's ancient history. But for baby boomers and Gen X, when you went to the supermarket in the 1980s, the array of fruits and vegetables was limited. With lettuce, it was iceberg. Romaine, red leaf, Boston… forget about it. If you wanted variety and yearned for organic, the only place you'd find it in those pre-Trader Joe's and pre-Whole Foods days was in small health-food stores in the low-rent section of town. By the early 1990s, this began to change. The organic trend blossomed. Why? Despite claims by chemical companies such as DuPont that "used correctly, there should be negligible risk to human beings… chemicals that fight weeds, fungus and pests provide a major benefit in producing abundant, affordable food supply," a wide spectrum of an educated society began to make the connection. That connection was simple. Eating foods laced and produced with multiple combinations of chemicals and pesticides posed high health risks. Scientific evidence eventually confirmed the spectrum of ill effects of processed, chemically laden foods. Large-scale food producers could no longer deny the evidence. And as I predicted, a robust, growing countertrend parallel industry was born. While still a minority of the total food market, the $43 billion organic/clean food sector has steadily grown. Many of the small startups back then are now owned by corporate giants who were losing market share due to pay-more-to-stay-healthy consumers. Just as I predicted the birth of the clean-food movement, we predict the rise of "clean phones" for essentially the same reason: A large market sector is ready to put its money where its health is. The world is wireless. And the smartphone and its comparable cousins are now the sources of numerous studies showing that radiation from the devices may be tied to brain cancer and other ailments. The health risk list keeps growing. In fact, initial findings of a study released in May by the federal National Toxicology Program found that radiation from radio-frequency exposure caused tumors in lab rats. Therefore, as evidence grows and public awareness regarding health risks of chronic cellphone use increases, particularly among children, the same market segment that pays for clean food will swiftly gravitate to "clean phones." Thus, safer cellphone devices that are effective and marketed with a "clean phone" theme and brand will corner a market with rich and growing potential. The post Is This the Next Mobile Phone Movement? appeared first on Daily Reckoning. One in six investors chose gold as the best place to park money they wouldn't need for more than 10 years -- the same number that chose stocks, according to a recent Bankrate survey. Another 6 percent chose bonds, while 25 percent chose real estate and 23 percent said they would simply bank the money. Welcome to this week’s Market Wrap Podcast, I’m Mike Gleason. Coming up we’ll hear a fantastic interview with Dr. Chris Martenson of PeakProsperity.com, author of the Crash Course and now his wonderful new book Prosper. Chris will give us his amazing insights on a range of topics, including the real reasons behind the recent and surprising stock market rally, what to expect in the precious metals markets in the weeks and months ahead and the steps you can take to protect yourself in the face of ever-growing domestic and global chaos. You simply do not want to miss a must-hear interview with Chris Martenson coming up after this week’s market update. John McDonnell, UK Shadow Chancellor of the Treasury (at least it sounds important) appealed to his -Labour- party on Sunday morning TV to “stop trying to destroy the party”, and of course I’m thinking NO, please don’t stop, keep at it, it’s so much fun. When you watch a building collapse, you want it to go all the way, not stop somewhere in the middle and get patched up with band-aids. It’s alright, let it crumble, it’s had its day. And if it’s any consolation, you’re not alone. Nor is that some freak coincidence. ‘Labour’-like parties (the ‘formerly left’) all over the world are disintegrating. Which is no surprise; they haven’t represented laborers for decades. They’ve become the left wing -and even that mostly in name only- of a monotone bland centrist political blob. This post The Greenback Fires a Warning Shot: Are Commodities in Trouble? appeared first on Daily Reckoning. The U.S. dollar has fired a warning shot across the bow of the commodities market. Anyone exposed to metals, miners, and oil plays needs to heed the dollar's threat. If the greenback continues to press higher, we can expect more short-term pain in the commodity space. For the first half of 2016, the U.S. Dollar Index drifted lower. But in early May is where things really get interesting. 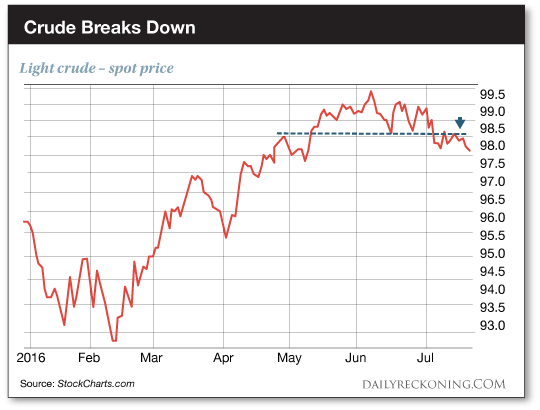 The buck tripped and fell flat on its face, tumbling below its 2015 lows. The dollar was quite literally teetering on the brink. It was threatening to give back most of its 2014-2015 rally. But the big breakdown never happened. Instead, the dollar ripped higher. Last week, it staged a massive breakout that could snap the greenback out of a 16-month funk—and unleash hell on the commodities market. 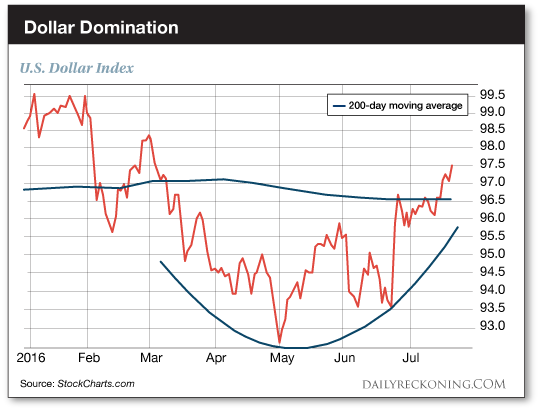 The dollar has reversed its fortunes and is now firmly above its 200-day moving average thanks to last week's breakout. Now, it's pushing toward its March highs. Many commodities are reacting negatively to the dollar's renewed strength. Of course, energy isn't the only group feeling the heat of a strong dollar. Gold and other precious metals are in a precarious spot this morning as they fight to remain above critical levels. It's no secret that gold has dominated the market this year. Gold futures have trounced the major averages. 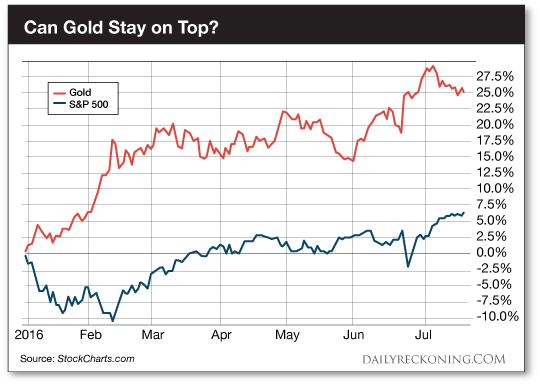 The metal is up 25% year-to-date, compared to gains of a little more than 6% for the S&P 500. Of course, all of this action is happening smack in the middle of central bank meetings. We have FOMC and the Bank of Japan potentially throwing wrenches in the gears this week. Both could utter a few magic words that could sharply extend the dollar's rally. P.S. Crush the commodities rally — sign up for my Rude Awakening e-letter, for FREE, right here. Stop missing out on the next big trend. Click here now to sign up for FREE. The post The Greenback Fires a Warning Shot: Are Commodities in Trouble? appeared first on Daily Reckoning. “It reminds me of that old joke- you know, a guy walks into a psychiatrist's office and says, hey doc, my brother's crazy! He thinks he's a chicken. Then the doc says, why don't you turn him in? Then the guy says, I would but I need the eggs. I guess that's how I feel about relationships. They're totally crazy, irrational, and absurd, but we keep going through it because we need the eggs.” - Woody Allen While there is no question of government enabling, (by decree or inaction), market manipulations haven’t really changed all that much in character over the centuries. Precious metals expert Michael Ballanger compares the Dec. 1, 2015 Gold COT Report with the latest one; the contrasts could not be greater. Jim Rickards, Egon von Greyerz, and Ronald-Peter Stoeferle on gold. Craig Hemke on negative interest rates. Brexit remains an issue, stocks are headed for a fall, and the Clinton Foundation is accused of corruption. The post Top Ten Videos — July 25 appeared first on DollarCollapse.com.